The team has been hard at work. We have squashed a couple of bugs and improved performance in many critical parts of the system. We are happy that Datamolino is very popular and the number of documents that we process for you keeps growing. That is why the team is focusing on performance and stability of the system. Until now Datamolino exported the Total of the bill and let Xero calculate the Tax Amount. On some invoices, the tax is not calculated from the Total amount, some items may not include tax. 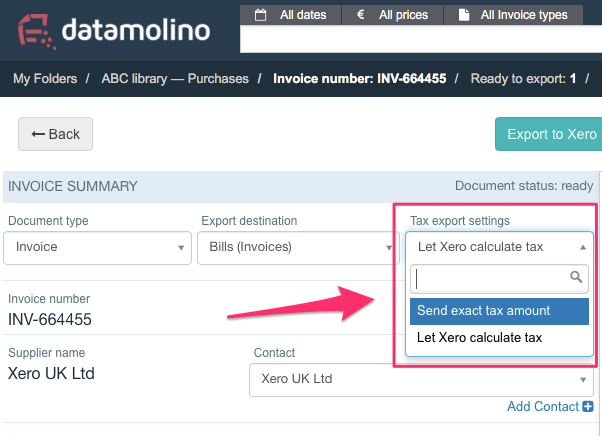 You can now tell Datamolino to export the "exact tax amount" to Xero. This gives you full control of the data that is sent to Xero. Datamolino remembers the ledger account and tax code with regards to each Supplier. The setting is remembered after each export. In addition to this, you can now choose to "Let Xero calculate the tax" or "Send exact tax amount" to Xero. This setting is also remembered on a "per supplier" basis. 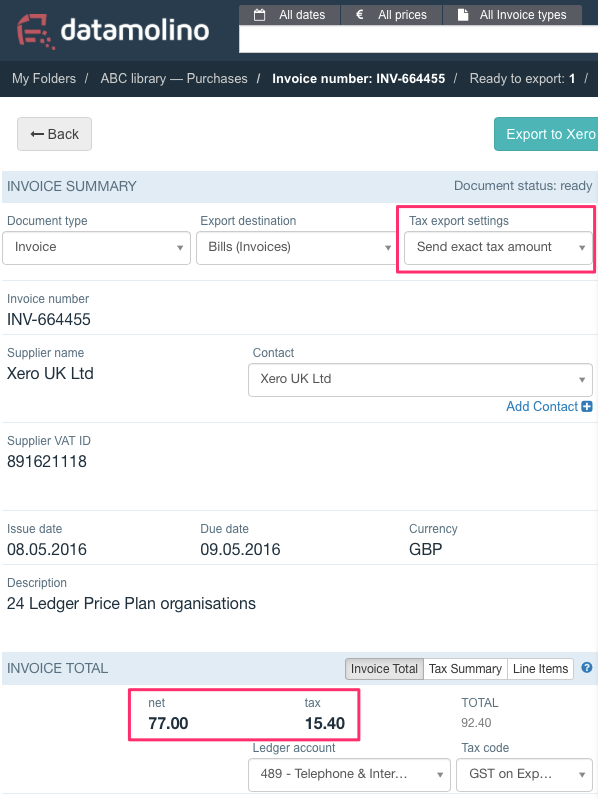 After you save the setting, the NET amount and TAX amount will be highlighted in bold letters to give you an indication that those figures will be exported to Xero. You may want to export exact tax amounts to Xero by default. Go to Folder Settings and in the "Tax export settings" dropdown select the appropriate setting. Do not forget to save your settings. Remember to check the NET and TAX amounts before you push the export button. The duplicate detection compares the data in the fields " Supplier name" and "Invoice number". If two documents match based on this criteria, Datamolino warns you that there may be a duplicate. (Regularly, any supplier should not issue two invoices with the same invoice number.) Now we warn you even if you create such duplicate manually. It is now easier to dismiss multiple errors or duplicates at once. Select the document using the checkboxes, click " More" and select "Dismiss errors / duplicates". Sometimes Xero sends us an error. Until now we have only shown this error to you. Since these error messages are usually written by software engineers, they were no really self-explanatory to regular software users. We have started to explain these errors a bit better. sometimes the Xero connection times out. Datamolino now tells you what is happening in clear human language. We have moved the export from document detail to the background queue. This allows us to serve multiple users at once and decreases load times for all users. If there is an export error, it will show up in the " Export errors" tab after the export queue has finished processing.